“I use antlers in all of my decorating.” NOT a line from Oscar Best Picture Moonlight. I know this. Obviously, it’s one of the more pointed (no pun intended) lyrics from one of Beauty and the Beast‘s signature tunes “Gaston,” performed most recently by Josh Gad and Luke Evans in Disney’s runaway blockbuster remake. 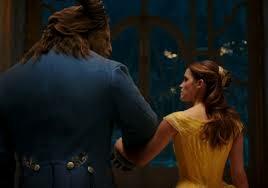 Last weekend I saw two movies – Beauty and the Beast (reviewed here) and Moonlight (on what was likely one of its last remaining weekends in movie theaters). I dashed off a fawning review (pun intended) of Beauty and the Beast, but I needed more time for Moonlight to marinate in my noggin. One of the elements I found so refreshing in Disney’s remake is its upending of the primacy of traditional masculinity (despite the hyperbolic gay panic surrounding the film in some less-enlightened quarters). 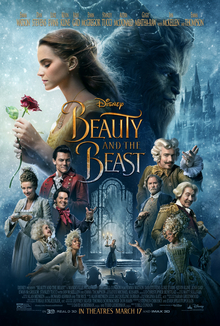 Much more clearly than its animated precursor, this 2017 version positions the athletic, muscular, debonair, trophy-hunting male (Gaston) as the true “beast” of the title. 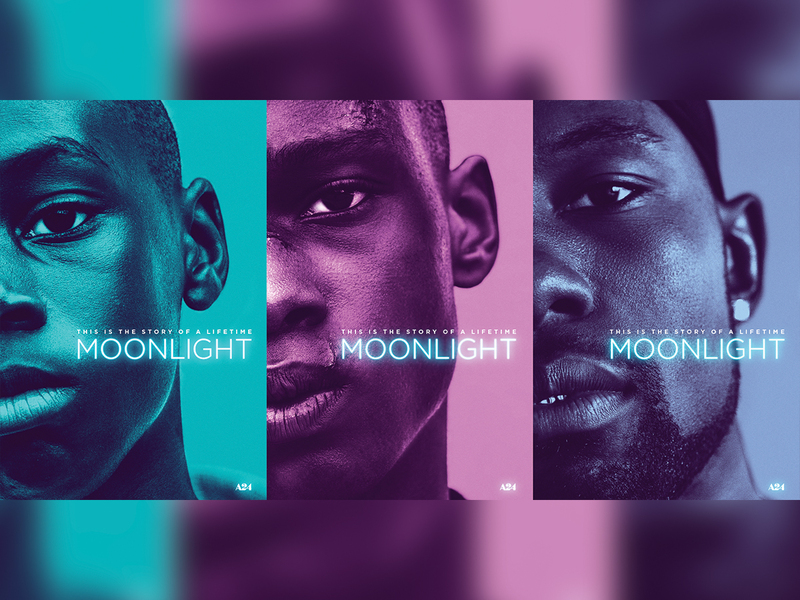 Moonlight has a similar questioning of masculinity running throughout its narrative, albeit more nuanced, though no less allegorical. I know I’m twisting my analysis into a pretzel comparing these two films, and it is really just the happenstance of seeing them the same weekend, but I do find this intriguing. There is a danger viewing a critically lauded film after it has won Best Picture. Your expectations far exceed what any film could withstand. That was true for me of Moonlight as well, but with a week’s worth of reflection, I see the power in this deceptively simple story of a young African-American man – told in three chapters (boyhood, adolescence, adulthood) – navigating a world that is economically, culturally, racially, socially structured to prevent the natural and healthy evolution of one’s truest self. 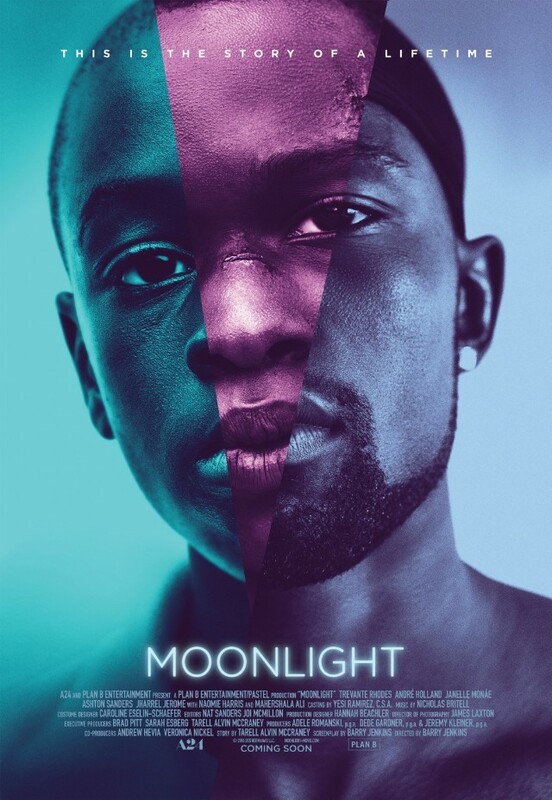 James Baldwin wrote, “Love takes off masks that we fear we cannot live without and know we cannot live within.” Moonlight, as written and directed by Barry Jenkins and based on Tarell Alvin McCraney’s unpublished semi-autobiographical play In Moonlight Black Boys Look Blue, traces the building of such a mask, and ends (hopefully) with its ultimate removal. We meet the silent, sullen, and fearful Chiron (Alex Hibbert in one of the purest, most compelling child performances ever captured onscreen) as he runs from a pack of bullies, ultimately hiding out in an abandoned drug house. 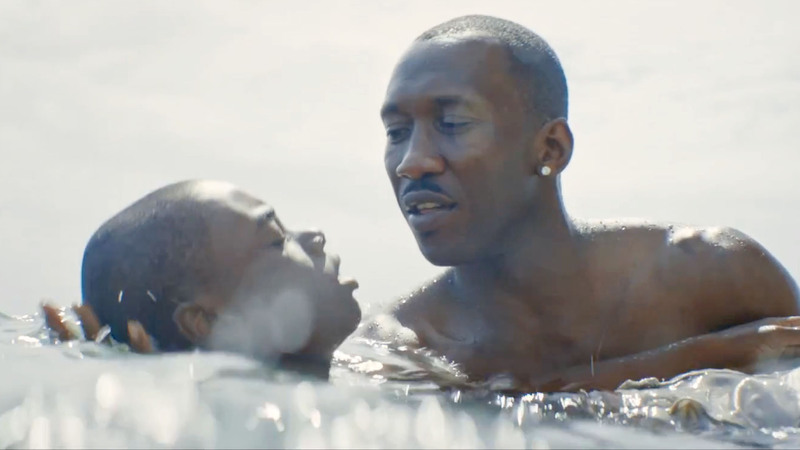 His rescuer Juan (in a detailed but subtle Oscar-winning performance by Mahershala Ali) is by all external appearances the prototypical “alpha male” – a successful businessman (in this case, the business so happens to be selling crack cocaine) who cuts a sinewy, shark-like path through the mean streets of Liberty City, Miami. Yet, his hard, intimidating exterior hides a soulful sadness and an empathy for young Chiron. He brings the boy home to his girlfriend Teresa (a luminous Janelle Monae) whose sweet exterior conceals a steely but well-intentioned determination. They care for the boy, give him a boost of confidence, and take him home to his loving but misguided mother Paula (the always exceptional Naomie Harris). The script saddles Paula with a cliched crack addiction (the drugs fueling which, of course, we come to find are actually supplied by Juan), but it is a testament to the exceptional acting that this narrative device is haunting and believable and sidesteps Lifetime TV-melodrama. At one point Juan counsels Chiron, “At some point, you gotta decide for yourself who you’re gonna be. Ain’t no one can make that decision for you.” Juan’s intent with this advice is for Chiron to be true to himself, but as the film’s narrative continues to stack the deck against Chiron, we see how impossible such a simple notion actually can be. 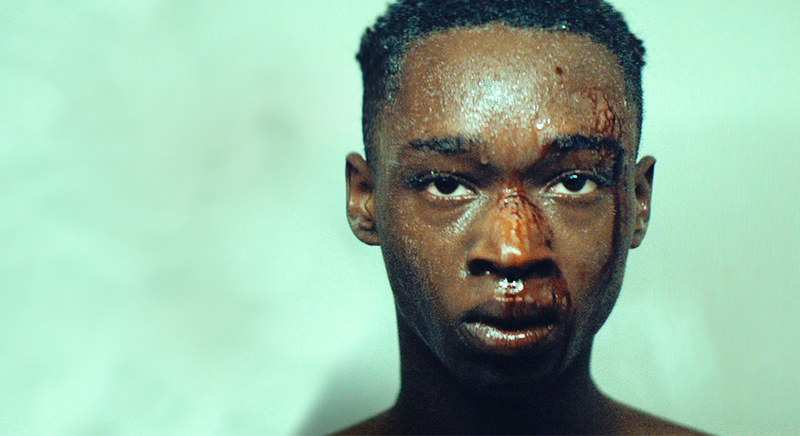 Ashton Sanders is exceptional as Chiron during this chapter, with a raw-boned anxiety that evokes Anthony Perkins or James Dean at their most heartbreaking. For a brief moment, Chiron finds love, but it turns sour really fast with a violence-begets-violence sequence that is as heartrending as it is inevitable. The film then again flashes forward for its third and final chapter. Chiron is an adult now, having survived some unspeakable off-screen horrors in America’s juvenile reform system. The doleful muteness of his youth has now curdled into an intractable, intimidating silence. 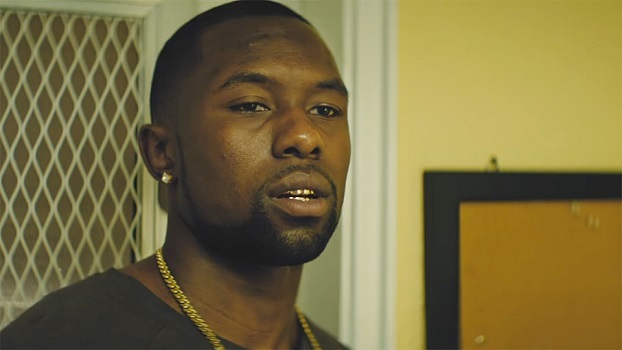 Chiron at this age – as played with brilliant physicality and wounded nuance by Trevante Rhodes – is an imposing figure, a doppelganger for his childhood mentor Juan. He is earning a healthy living selling drugs on the streets of Atlanta, his sensitive soul lost amidst layers of literal and figurative armor. (One spot of humor comes from the ostentatious “grills” he insists on wearing over his teeth, another example of his desire to harden himself before a world that has repeatedly rejected him.) The film seems to suggest we become what we know, sometimes in spite of our best selves, simply to survive. Life as ouroboros. The film concludes as Chiron reunites over dinner with his childhood friend Kevin (a warm, funny, and wary Andre Holland). We see the layers of galvanized steel forged from terror upon terror start to melt away, and we are left with the broken soul underneath. The final shot of the film is Chiron resting his head on his friend’s shoulder, perhaps relieved he can finally be himself, devoid of the culture’s artificial expectations of what it means to be a man. And that is the reason we need this movie right now.